For those not already in the know, Electric Moon is yet another band featuring the prolific Sula Bassana (guitars and effects), with Komet Lulu (fuzzbass, effects, vocals) and mono-monickered Alex (drums, percussion). Bassana (aka Dave Schmidt) currently oversees Sulatron Records, while simultaneously contributing to a number of other bands on the label. Formed by Schmidt in 2009, Electric Moon has released several albums in quick succession, including a number of limited-edition live sets. 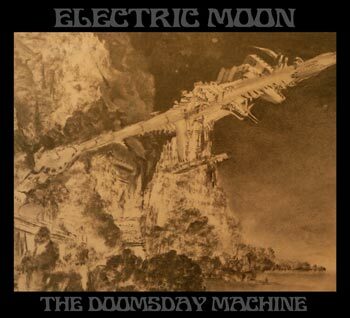 The Doomsday Machine is their second studio release, although even this was recorded mostly live, with few overdubs. When the press release for The Doomsday Machine states that “the whole thing is enveloped by a gloomy atmosphere”, it certainly does not overstate the matter. The twenty minute title track which opens the album leaks doom from every pore. This is pure psychedelic drone, relentless in its intensity, and heavy enough to make their earlier studio album – Lunatics – seem like a shot at mainstream rock! About halfway through this epic track, the machine disintegrates into an echoed and distorted soundscape with eerie cymbal crashes and electronic guitar feedback. The stomping beat and chants return in the final few minutes to finish off any work left undone. Echoing, sparse and definitely more compact at just over five minutes, Kliener Knaller sounds more like conventional rock, albeit with a definite psychedelic vibe to it. Spaceman rocks on solidly and gradually increases velocity, until it reaches cruising speed about halfway through its thirteen minute duration. Intensity, if not solemnity, is reined back for Stardust Service, which waxes and wanes across 20 minutes. The album closes with yet another lengthy (21:44) drone-and-sludge fest – Feigenonolog – which would be great had it not been preceded by an hour of cosmic intensity. As it is, the album feels a little overwrought, with some great playing and fine ideas stretched a little beyond optimum. Perhaps if a few of those longer tracks had been trimmed back a little, the album would have attained spacerock classic status. As it is, it serves as a good primer to the sprawling worlds of Sula Bassana and Electric Moon.